This elegant restaurant takes the word 'chic' to a new level. 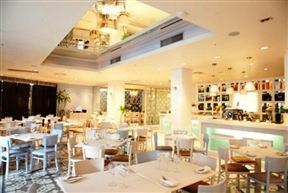 With its cool, tranquil interior that offers a haven for food junkies, Rocca finds it hard to disappoint. True Mediterranean cuisine is at the order of the day and fresh, seasonal ingredients make the dishes burst with flavour. Al fresco dining is a great experience on balmy summer evenings in the Cape and a classic cocktail to complement the sunset is definitely some form of heaven. The cosmopolitan ideas running through the interior and food makes Rocca a stand-out among the area's restaurants, and the warm yet professional service is simply the cherry on top. Relaxed, yet vibey, detailed yet uncomplicated dishes and bustling surroundings make this restaurant a must-try. •	The Square, Cape Quarter will be on your left. Rocca is 1.7km from the centre of Cape Town , the nearest airport 21.2km (Cape Town International Airport).